The Land Registry has unveiled plans to use artificial intelligence (AI) in conveyancing and also publish data on conveyancers’ performance. 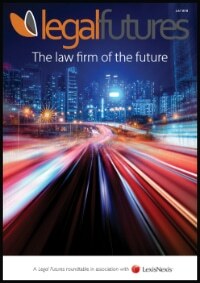 It comes as a Legal Futures report – published today – highlights how the use of data is set to change commercial conveyancing and the law firms which do it. 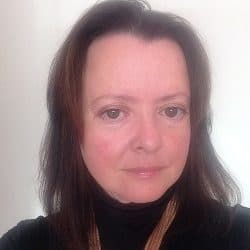 The Land Registry’s five-year business strategy – which envisages having registered more than 90% of land in England and Wales by 2022 and all of it by 2030 – outlined how its ‘Digital Street’ project could improve the conveyancing process. It will shortly finish creating a pilot digital register for a small selection of properties, which will be fully machine readable and able to be updated instantly. Digital Street would also enable novel business models, the strategy predicted. Blockchain was also part of the picture. It might enable the register to be distributed among trusted parties such as lenders and conveyancers, “giving them the ability to operate and update in a secure and tamper-proof manner”. The commitment to the Land Registry opening its data including “looking at publishing our comparative conveyancer data to provide the end consumer with a real picture of how well their conveyancer is performing, and to enable firms to track their relative performance”. 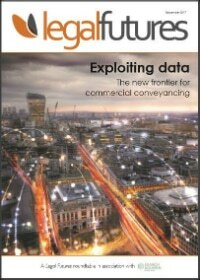 The report – featuring a roundtable of commercial conveyancing experts, sponsored by Search Acumen – focused on what increasing access to data meant for lawyers and their clients. There was recognition that this would focus lawyers more on the legal and risk side of their work, rather than processing data. But Law Society vice-president Christina Blacklaws said this was a “dangerous” road to go down. “My vision of the future is that we as a profession embrace and own this technology. If we do not own it, then other people will, and we will struggle to be relevant to our client base. Andrew Denye, a partner at Orrick, argued that there was a difference between a law firm investing millions of pounds in a platform, and using and paying a third-party provider to deliver the information for each transaction. The full report can be read online or downloaded here.